Qualifying Report - Yes, yes, yes, yes, yes! "Whooo, hooo! Yes, yes, yes, yes, yes!" 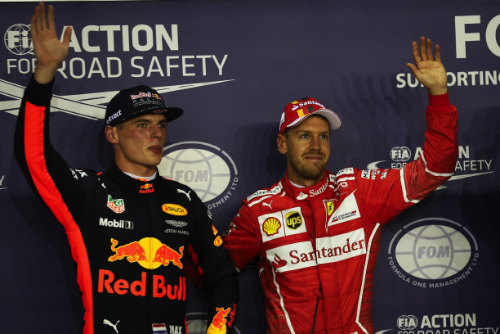 Sebastian Vettel said after winning the pole for the Singapore Grand Prix. The Red Bull drivers had been quick all weekend, but in the end Max Verstappen and Daniel Ricciardo ended up second and third on the grid. The ambient temperature at the start of qualifying was 82 degrees Fahrenheit (28 degrees Centigrade) and the track temperature was 91 degrees Fahrenheit (33 degrees Centigrade). The lineup for the weekend was: Mercedes Lewis Hamilton and Valtteri Bottas; Red Bull TAG Heuer Daniel Ricciardo and Max Verstappen; Ferrari Sebastian Vettel and Kimi Raikkonen; Force India Mercedes Sergio Perez and Esteban Ocon; Williams Mercedes Felipe Massa and Lance Stroll; McLaren Honda Fernando Alonso and Stoffel Vandoorne; Renault Nico Hulkenberg and Jolyon Palmer; Toro Rosso Renault Daniil Kvyat and Carlos Sainz; Haas Ferrari Romain Grosjean and Kevin Magnussen; Sauber Ferrari Marcus Ericsson and Pascal Wehrlein. Pirelli had its soft, super soft and ultra soft slicks, but everyone went out immediately on the ultras as the 18-minute Q1 began. Vandoorne put the McLaren out front but not for long as Verstappen took over and then Ricciardo with a 1:42.846. Hamilton went second, a tick slower at 1:42.884. Massa hit the wall with the right rear of the Williams and headed for the pits. Verstappen was now third ahead of Bottas, Raikkonen and Vettel. Then Verstappen retook first with a 1:42.010. Down at the cut line, Magnussen was 15th, Palmer 14th and Wehrlein 16th with four minutes remaining. Now most of the top 10 stayed in the pits and let those below fight it out in the final moments. And the track evolved and got faster, so there was a lot of reshuffling of the order. The five drivers who were eliminated at the end of Q1 were: Magnussen, Massa, Stroll, Wehrlein and Ericcson. The fastest 15 drivers who moved on to Q2 were: Verstappen, Ricciardo, Alonso, Sainz, Vandoorne, Hamilton, Palmer, Kvyat, Hulkenberg, Bottas, Raikkonen, Vettel, Perez, Ocon and Grosjean. So there had been some interesting additions to the top 10 like Palmer, and misses like Vettel. What would the top 10 be like heading into Q3? All 15 drivers were soon on track for the 15-minute session. Vettel went to first with a 1:40.529. Verstappen came by to clock a 1:40.379. Ricciardo could only manage third. Next after the first round of runs were Hamilton, Vandoorne and Bottas. Palmer was 10th and on the bubble, with Sainz ninth and Alonso 11th. The drivers now pitted to prepare for another and final run. The later the better, if Q1 was any indication. All the drivers were on the track with two minutes to go. Verstappen improved to a 1:40.332 and Ricciardo to a 1:40.385. Raikkonen moved to third ahead of Vettel, Hamilton, Vandoorne, Hulkenberg, Bottas, Alonso and Sainz. The five drivers who were eliminated at the end of Q2 were: Palmer, Perez, Kvyat, Ocon and Grosjean. Q3 lasted 12 minutes, and Alonso was first out in the session. And then there were 10 on track. First of the fastest was Raikkonen with a 1:40.069. Then Verstappen clocked a 1:39.814 only to be beaten by Vettel's 1:39.669. Ricciardo took third at 1:39.862 ahead of Raikkonen, Hamilton, Bottas, Alonso, Vandoorne, Hulkenberg and Sainz. Once again the drivers pitted and got ready for one final burst. Vettel got down to a 1:39.491 to win the pole. Verstappen did not improve but stayed second ahead of Ricciardo who clocked a 1:39.840. Raikkonen, Hamilton, Bottas, Hulkenberg, Alonso, Vandoorne and Sainz filled out the top 10.